With our new content builder, you have the option to edit the settings of each of the blocks you place on a page. This gives you control over how you want each block to look and behave when it appears on your website. In this section, we will look at the four different areas of the Block Settings and what changes can be made. To edit the Block Settings, once you have added a new block to a page you will see several symbols on the right-hand side. The second icon on the list is your Block Settings. Once you click on the blog settings, you are given four different tabs to choose from - ‘Block’, ‘Background’, ‘Animations’ and ‘Elements’. The first tab is the ‘Block’ tab. This section allows you to edit both the Colours of your Block as well as adjust the height. You can use these to flick between different colour options that have been preset in your Design Studio. When editing the height of your Block you can choose between having the block at Full Height, which when toggle ON will set the block to the standard height that has been pre-set or you can choose to manually edit the Padding of a block. Padding is the term used for the area at the top and the bottom of each block - this is the space above and below the main content. When ‘Lock Padding’ is switched on, as in the above image, you can adjust the padding using the slider. This will adjust the top and bottom padding at the same level. However, if you wanted to adjust the top and bottom padding separately, you can toggle ‘Lock Padding’ off and manually adjust each by using the new sliders that appear. This will allow you to move content closer together or further away on a page, either giving the appearance of blocks combining or showing that they completely different areas of the page. The Background tab allows you to add your own background image to each individual block. You can either upload a new image or select from the Images you have saved on your Account. Once you have selected an image, you will be given further options. 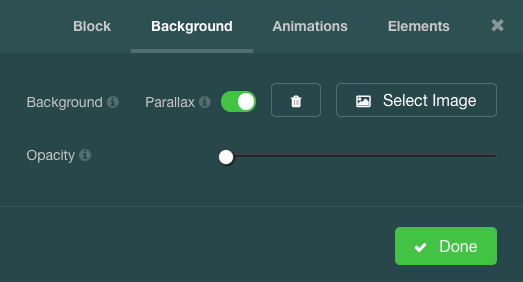 Parallax - Parallax gives your background an amazing illusion of depth and motion by letting the image scroll separately from the rest of the content in the block. As you scroll, more of the image is revealed! Opacity - Opacity allows you to adjust the transparency of the image you have selected. This is great to make any other content on the block readable or to emphasise the background. With our new content builder, you can animate each block so when you scroll down the page each block has a different action. 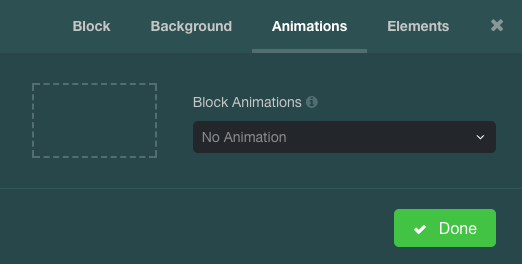 When choosing between the variety of options that are available, in the box next to the Animation Selector, you will get a preview of what each action will look like. Every block in our new content builder is not restricted by the content that it already contains when you add it to a page. 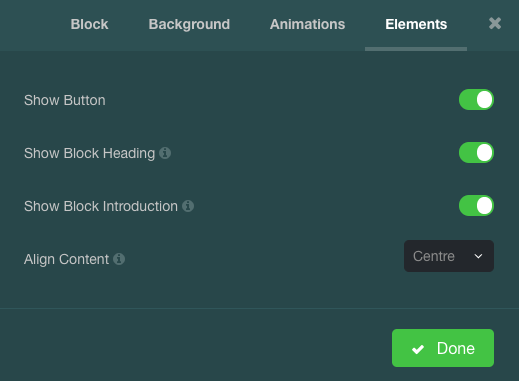 Under the ‘Elements’ tab you can choose if you wish to add a Button, a Block Heading, a Block Introduction and even if you want the text to be Left, Centre, or Right Aligned within the individual block.